Nitrogen source selection, the dollars and cents. 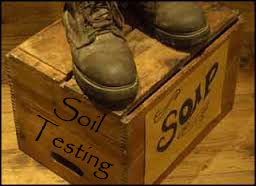 A common question most soil fertility specialist receive goes along the lines of “Where anhydrous ammonia has been one of the cheapest N formulations available, dry fertilizers can also be competitive. 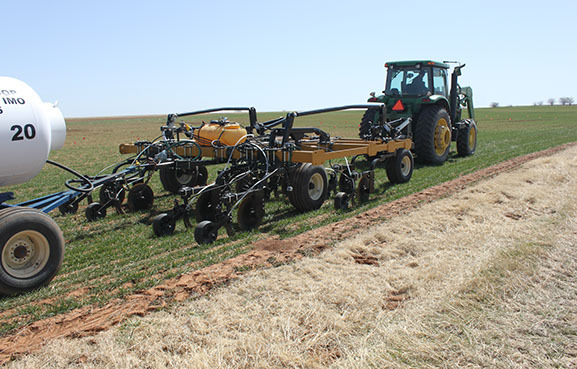 From a cost and effectiveness perspective, which is going to be the better deal this year?” This question was recently posed to Agronomist Fields Notes of The Wheat Farmer/Row Crop Farmer produced by Layton Ehmke. What follows is a more in depth version of the response I provide to Layton. 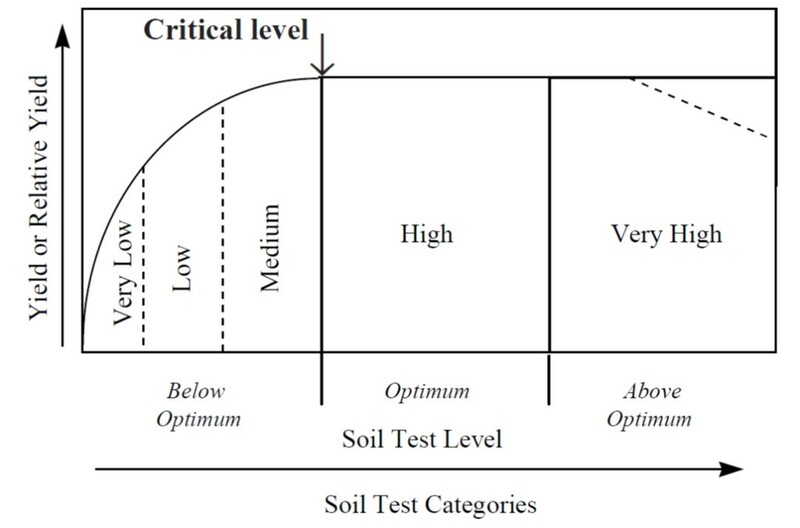 Unfortunately if all angles are considered this is not an easy answer as determining which nitrogen product is a multi-faceted issue. So on the outside looking in at just the price per 100 pounds of N applied NH3 is $7.00 cheaper than Urea and $11.00 less than UAN. However the second part of the equation is application cost. Looking at the custom rate for 2015-2016 provide in the OSU Current Report 205 which outlines Oklahoma Farm and Ranch Custom Rates. While these are higher than if the producer owns the equipment it is still a good estimate which accounts for time, service, and repair. 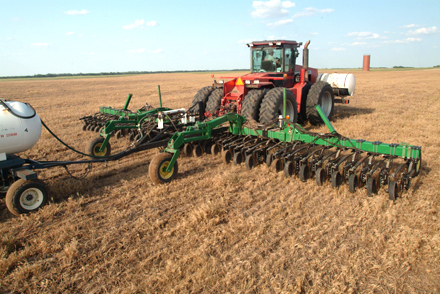 The average NH3 application cost is $13.75 while spreading dry fertilizer is $5.41 per acre. The cost of running a sprayer is similar to sprMy Siteeader per acre. So if application and N cost is taken into account at 100 lbs N per acre NH3 is $1.34 cheaper. However the amount of N really impacts this last calculation at 50 lbs of N per acre urea is $4.84 per acre cheaper while at 200 lbs NH3 is $5.66 per acre cheaper. The third consideration should be the efficiency of the fertilizer. I could and should right a blog solely on the efficiency of nitrogen fertilizer applications. However that is a big mud hole I do not quite have the time to get into. So what follows are a few general consideration. 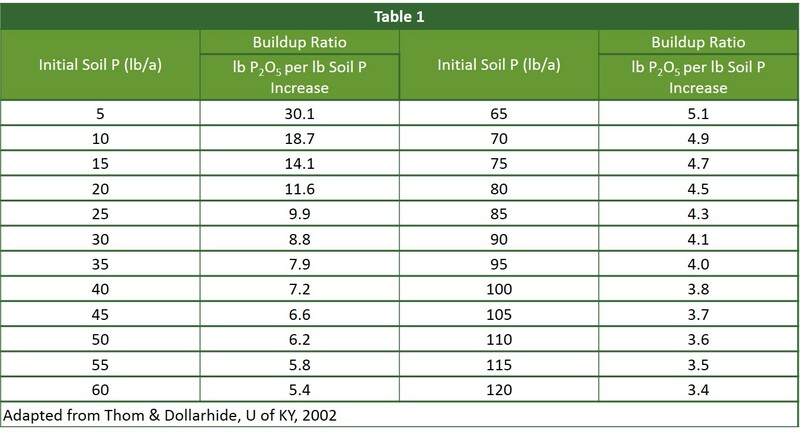 Spring applied urea on no-till will have a significantly higher potential for N loss, from urea volatilization, than NH3 knifed in. Surface applied urea not quickly incorporated in via rain or tillage (added cost) is easily subject to losses greater than 33%. While NH3 applied with proper soil moisture and good seal will have losses in the single digits. The losses from UAN is somewhere between Urea and NH3 as only 50% of the N in UAN is urea. 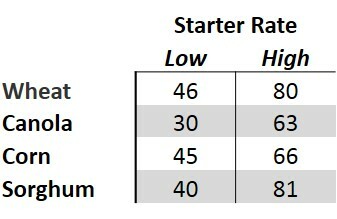 Also method (steamer/flat fan), percent canopy coverage, residue level, and weather will play a part. However is all in is applied pre-plant and NH3 but urea or UAN is applied in season there may be more losses from NH3. The loss of N should be taken into account and added to the cost of N. Lost in could be estimated in two ways, the cost of replacing lost N or the cost of lost yield. To figure replacement take the pounds of N needed (100 lbs) divide by the efficiency, in this case lets say you will lose 20% so 100/.8 = 125. So to get 100 lbs of N to the crop you much apply 125, which increased total N cost to $46.25 per acre. On the flip side if you lose 20% of 100 lbs and needed all 100 lbs of N then you stand to lose (20 lbs N / 2 lbs N per bushel) 10 bushel at $4.00 per bushel. High clearance sprayer out fitted with streamer bars for UAN application and GreenSeeker RT-200 optical sensors for on the go variable rate nitrogen application. The final consideration is the ease and or efficiency of use. Some will choose a high priced product because they would prefer not to work with NH3 due to its challenging properties. The ease of use is also where the liquids (UAN) shine. On sight storage of UAN requires the least amount of infrastructure and transport is fairly easy. The application cost of liquid is nearly the same as dry so considering the prices above 100 lbs of N as UAN will cost $4.00 per acre more. However a 100’ sprayer can cover approximately 30 acres per hour more than a spreader with a 60’ swath (Iowa State Pub). Below is a table that provides a few common applicator widths and speeds. If you consider the average NH3 rig will run 6 mph while spinners commonly run at 12 mph, you can cover significantly more ground with urea. 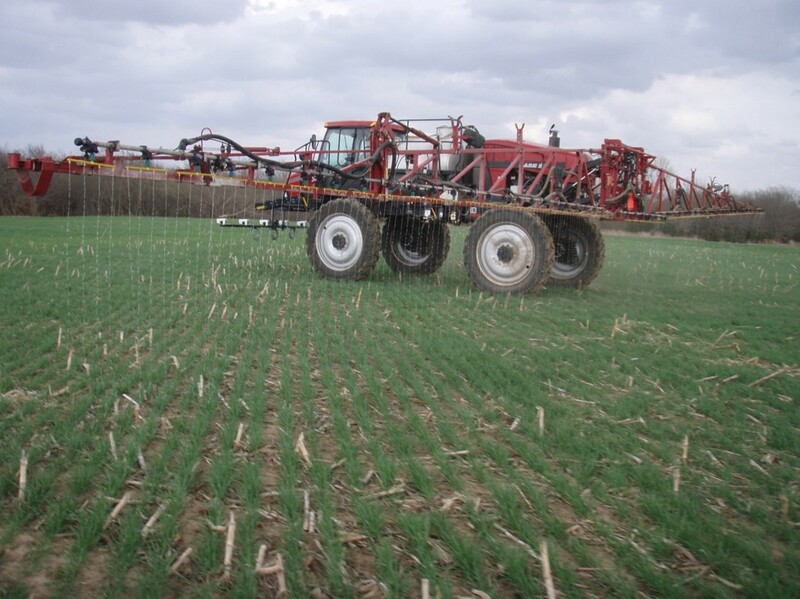 Add to the equation a big sprayer and flat long field and applicators can covers a lot of ground quickly with UAN. So if time is of the essences it makes perfect sense to spend more per pound of N to get it on faster. Acres covered per hour based on width and speed. High speed not applicable for NH3 application. In the end the right source often comes down to the specific situation, time, and personal preferences. If you take all of the variables into account, you will be making best decision possible based upon the information available.